I’m a fifth year undergraduate at the Georgia Institute of Technology studying industrial and systems engineering, and I plan to attend graduate school this Fall–but not for anything related to industrial and systems engineering. I plan to pursue a PhD in geoscience, with a focus on paleoclimate. How did I end up here? What even is paleoclimate? I spent five years diligently studying stochastic systems, designing simulations, and developing optimization models. I even spent an entire year training to be an industrial engineer at a manufacturing plant. What made me decide to dedicate the next five years of my life to paleoclimate? Why does paleoclimate even matter? It all began when I was introduced to the endless wonders and wealth of information that corals can provide. I started studying corals when I took a class by Dr. Kim Cobb, a professor in the school of Earth and Atmospheric Sciences at Georgia Tech. She was teaching a course on sustainability that I happened to be enrolled in to fulfill some breadth requirement for my degree. Although I enrolled in the course thinking it would be an easy-A class, I quickly became more and more enthralled by Dr. Cobb’s inspiring lectures on climate science, one of the most discussed topics concerning the sustainability of our beloved planet. Her passion for the subject was evident and it reminded me of how much I love and care for the Earth. It’s something that has always been a great interest of mine but has gotten lost in the midst of my time-consuming engineering studies. One day after class she announced that she was seeking an undergraduate research assistant for her climate lab. Having never been involved in research at an R1 research university (the highest research activity classification) and also wanting to experience ways to further pursue my long-lost passion for the Earth, I decided to join Dr. Cobb’s paleoclimate lab. Paleoclimatology is the study of past climate. Why do we need to study past climate? If it is so important, how do we study past climate from times before we had thermometers? Instrumental climate data only extends to the mid 1800s (1), at best, and a century of climate data on a planet that has existed for over 4.5 billion years (2) is simply insufficient when trying to understand long term climate trends. This is particularly critical when trying to distinguish natural climate change from anthropogenic climate change. How do we know what the temperature was on Earth thousands or even millions of years ago? Luckily for us, the Earth is home to an archive of past environmental information. We can use geochemical proxies, which allow us to reconstruct past environmental conditions to understand atmospheric dynamics, oceanic circulation, hydrological properties, and so much more. The potential from these proxies is endless. These proxies, which are found in geological archives such as corals, tree rings, ice cores, and sediments, are covering the Earth. A wealth of knowledge is sitting at our fingertips, waiting to tell the stories of the conditions in which they have survived. My research in the Cobb lab involves geochemical proxies in corals, or more specifically, oxygen isotopes in the corals. 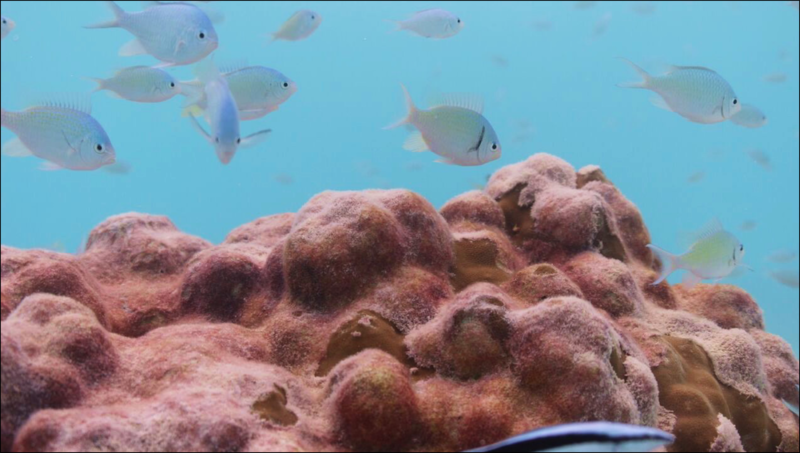 Because corals are so sensitive to changes in the condition of the waters they live in, their carbonate skeletons can be chemically analyzed along their growth axes to understand how the conditions of water have changed over time. These conditions include sea surface temperature (SST), salinity, and pH, which in turn tell us temperature in the area the corals are from, rainfall patterns, and intensity of ocean acidification (3). For instance, the coral oxygen isotopes are particularly sensitive to SST, with some influence from salinity. 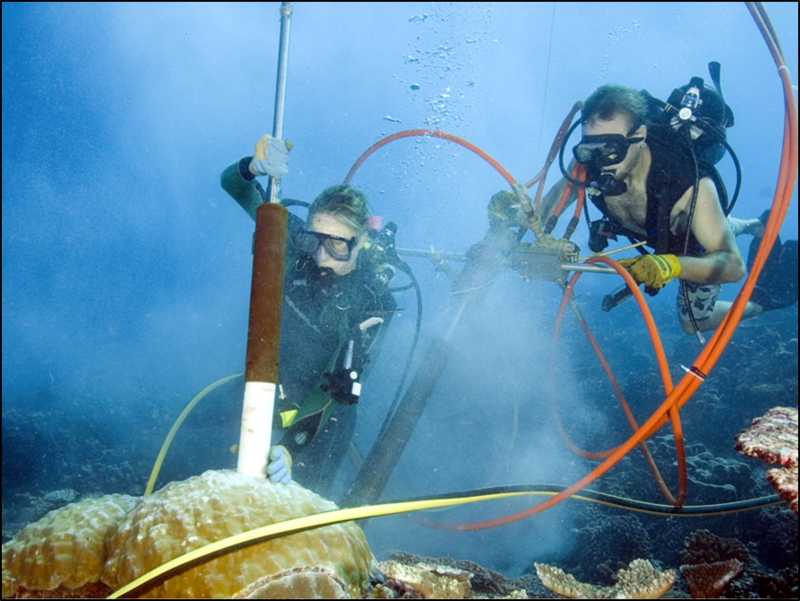 Thus, when we measure the coral oxygen isotopes of the coral from the surface all the way to the base of the coral, we can reconstruct the temperatures in which the coral grew. This is because warmer conditions cause coral oxygen isotope abundances to become depleted, whereas cooler conditions produce an enrichment of these isotopes in the coral skeleton. The reliability of this proxy has been vastly and rapidly improving through replication and, when available, comparison with instrumental SST records. My undergraduate research project involves the paleoclimate reconstruction of corals in the central tropical Pacific during the massive El Niño event of 2015, which is the largest event on record as shown by some instrumental records. El Niño events are natural climate phenomena that occur every 2-7 years and bring climate extremes to various regions of the world, including heavy rainfall and severe droughts. For instance, if you are a resident of Georgia, you have noticed that this past winter has been unseasonably warm and dry. This is because we are currently experiencing a very strong La Niña event, which often brings climate extremes opposite those of an El Niño event (these strong La Niña events often occur for one or two years following a very strong El Niño event). In my research on this 2015 El Niño event, I have reconstructed SST by analyzing the coral oxygen isotopes in several cores from Kiritimati Island in the central tropical Pacific, in the heart of the El Niño region. I have several research goals in my project, but some of the major ones include: understanding the magnitude of the event by analyzing coral oxygen isotopes in an ensemble of corals from the central tropical Pacific, comparing that magnitude to instrumental records to understand how the signals differ, and comparing the magnitude to past coral oxygen isotopic records to understand the variability of El Niño events over time. Some findings suggest that these events are intensifying over time and becoming more variable, so this is an active area of research. Understanding these events in both the natural and anthropogenically-forced sense is critical when trying to understand human impact on the environment and trying to predict the occurrences of these events. So how did these corals change my life? My research on corals has exposed me to a whole new world of science that I never knew I would be so passionate about. In about one year of undergraduate research I took on this independent project, learned how to use a mass spectrometer, did field work on Kiritimati Island, gave a talk at the world’s largest Earth Science conference in the world, and have been accepted to four graduate schools to pursue a PhD in paleoclimate. I also just found out today that I was awarded the National Science Foundation’s Graduate Research Fellowship, which provides me with funding to attend any graduate school for the next three years. If I hadn’t taken Dr. Cobb’s class and fallen in love with her coral climate science research, my life trajectory would be worlds different right now. I never imagined I would be in my fifth year of undergraduate studies and be so eager to spend another five years in school. However, I have been exposed to the world of geochemical proxies and I don’t ever want to leave. It took me two majors, one year of co-oping, one year of research, and five years of school to find my passion, but I wouldn’t change a thing about my undergraduate choices because they led me here. As for my next steps, my list of options for graduate research studies include water isotopes in ice cores, clumped isotopes in sediments, cosmogenic nuclides in subglacial bedrock, and maybe even more corals. I never thought this would be my life path but I’m excited to work on science no one has ever done before and answer questions about the universe that have never been answered. Speaking from experience, it doesn’t matter if you’re already going down one path in life. If you’re not sure if you’re making the right choices, try other things and see if you find something that would bring you more happiness. Gemma is a 5th year Industrial Engineering major at Georgia Tech. She is very passionate about climate science and conducts paleoclimate research that uses coral geochemistry to reconstruct temperature records in the central tropical Pacific.